Mirtha Chocolate - How Sweet it Is! How Sweet It Is - Chocolate! Mouseover to see Mirtha's favorite food! Mmmm…what a sweet, delicious subject…and good for you too! It's not as bad for us as we once thought. So…may your cupboards always remain full of the staple of many a hormonal women’s life – CHOCOLATE! It’s just chock full of good things! What, you say? Seriously, it's GOOD for you! Sit back and let me tell you... how sweet it is! Did you know that chocolate is, in fact, a vegetable? It is! 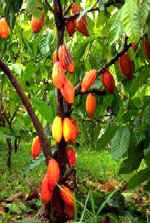 Chocolate is derived from the cocoa bean. Beans are vegetables, aren’t they? And…since sugar comes from sugar cane or sugar beets, that means they are vegetables too! Therefore, chocolate is a vegetable! It is…really! If it's hard to believe anything that tastes so good can be good for you, look at the Nutrition Facts and see - it's got Vitamin A and Calcium too! Eat a chocolate bar before each meal. It’ll take the edge off your appetite and you’ll eat less. A box of chocolates provides you total daily intake of calories at one time! Chocolate covered raisins, cherries, orange slices and strawberries all count as fruit – so eat all you want! Yahoo! If you’re worried about calories, put your chocolate on top of the fridge. Did you know that those pesky calories are afraid of heights? They will jump right out of the chocolate as an act of self-preservation. If you eat both dark and white chocolate together, they cancel each other out. It’s also considered a well balanced diet. ...except a good friend with chocolate! 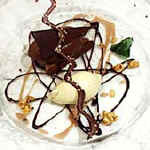 Chocolate is a well-known stress and depression reliever. All hormonal women know this! There is a chemical in chocolate that causes the endocrine glands in your body release “happy hormones”. So get out that chocolate! Combine vodka, crème de cacao and Cointreau in a mixing glass with ice. Shake or stir. Strain into chilled martini glasses. Garnish with an unwrapped Hershey's Kiss. Don't overlook chocolate in the garden - try one of these: Chocolate Vine (akebia quinata), Chocolate-Drop Orchid (cattleya), Chocolate Cosmos, Chocolate Ecstacy Iris, Chocolate Flower (berlandiera lyrata), Chocolate Habanera Pepper, Chocolate Lily (anthropodium strictum), Chocolate Plant (graptophyllum), Chocolate Taffy Daylily, and Chocolate Huechera. Death By Chocolate! Cake, that is. Try this one and you'll think you've gone to heaven! Beat eggs, sour cream, water, and oil together in a large bowl until thoroughly mixed. Add cake mix and pudding mix. Beat until smooth. Stir in chocolate chips. Pour into Bundt or tube pan and bake at 350 F for 1 hour. When cool, sift powdered sugar on top of cake. Variation: Replace 1/4-cup water with Grand Marnier. I never met a chocolate I didn’t like! Did you know that it takes 400 cocoa beans to make one pound of chocolate? Better get growing! Were you aware that the people in Switzerland (they love their chocolates and I do too!) eat twice as much chocolate as Americans but have a lower obesity rate? Guess what? Chocolate has less caffeine than a coffee? Forget Starbucks and Tim Hortons! I will be opening a chain of Guess what? Chocolate has less caffeine then a coffee? Forget Starbucks and Tim Hortons! I will be opening a chain of Mmmm...Mirtha's! in late 2004! Chocolate has many preservatives – preservatives make you look younger longer so eat up! ...you’re eating it too slowly!